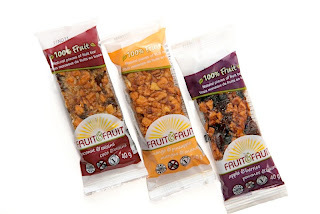 As a huge fruit fan, I was excited to try these Fruit&Fruit bars made with only fruit. I was sent the three varieties including the coconut & raisins, mango & pineapple, and apple & berries. Each bar has 2 servings of fruit in them. I look for products like this to eat when working at the hospital when my blood sugar gets low. It provides some quick nutrition to get it back up. My favorite of the bars is the coconut & raisins one. It is full of flavorful coconut and tastes great. I like that the bars are nice and soft and chewy. Also, the mango & pineapple one is sweet and fruity. These bars make a perfect snack for on the go. They are not too overly sweet like you might imagine with dried fruit which is good. Here is some information about them: Fruit&Fruit bars are 100% natural with a unique texture and taste. Made of real fruit pieces (not mashed fruit), these bars are chewy and deliciously fruity. The ingredients list is simple – it’s just fruit! The bars contain no sulphites, no preservatives, and no artificial ingredients. 100% of all sugars come from fruits! Fruit & Fruit bars are peanut free, gluten free and are produced in a nut-free facility. For some tasty fruit bars, check out Fruit&Fruit! Wow these sound yummy. I haven't seen them in the stores. These sound definitely up my alley! Especially with the fact that they're gluten free with no preservatives, etc.